Final Test, a branch of the Prysmian Quality Assurance (QA) department, is the last line of defence in ensuring we supply the highest quality cables in the industry. In order to manufacture reliable and safe products, we are required to adhere to various national and international standards. Our NATA accredited laboratory in Liverpool NSW, contains state of the art facilities which enable us to perform all necessary compliance tests. A part of this team is Pavan Beesetty – previously a Final Test Officer, 2018 saw Pavan take on a new role as the Quality Manager for our energy business. At our Liverpool plant, we manufacture a variety of energy cables. This unique range of products adds complexity to the testing process, as different cables have different preparation and testing methods. “We just finished conducting Partial Discharge, HV Withstand and Conductor Resistance testing on an 11kV single core (according to AS1429.1). Whilst this testing only took around 30 minutes, testing a cable for specialised application such as an Airfield Lighting can take more than 24 hours.” Pavan explained. 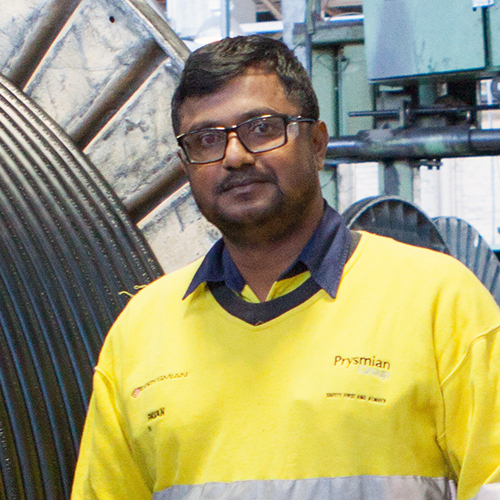 A big thanks to Pavan and his 7 teammates in the Final Test team, their commitment and perseverance safeguards our claim to producing quality and safe energy cables – For Quality, Think Pink.